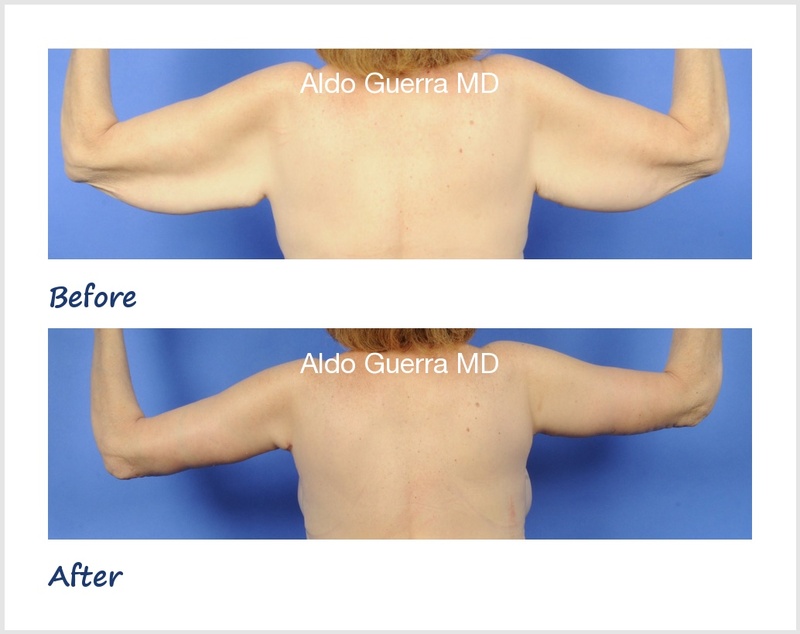 This is a pleasant 57 year old lady from Scottsdale, Arizona who desired tighter arms and more youthful looking, fuller breasts. She consulted with me at my Scottsdale, Arizona plastic surgery center. Previously, she had surgery on her breasts and had a breast lift with silicone breast implants, but was not happy with the size. At the time of her consult she also told me that she had gastric bypass surgery 5 years ago and managed to lose over 120 pounds. She has kept the weight off and is healthier, but she did not like her arms and breasts. She also wanted surgery on her tummy and back, a body lift, and thigh lift as well. She discussed her wishes. She mentioned that her goal was to have natural plastic surgery results, including nice and tight arms and a larger bust. She liked my technique for arm lift and axillaplasty and breast implant exchange. She mentioned she had been a D before the weight loss, but was now wearing a C cup. She wanted me to return her breasts to a D without having another breast lift. She decided on a combined cosmetic surgery procedure. She decided on the posterior arm tuck technique that hides the scar in the back of the arm. This arm lift technique also removes excess skin in the arm pit region. She also had a breast implant exchange procedure and we placed 500 cc high profile silicone breast implants. She is shown 8 weeks after cosmetic surgery on her before and after photographs.